The team at The Mod Sentry were fortunate enough to get an early look at the new demo for the open Outcast mod (mind you it is available via torrent for those who want to play it now). You will need to download the Crysis Wars trial in order to play. 3. Write “-mod OpenOutcast” on it. 4. Double click Crysis Wars or select Play Game to run. 6. Your mod setting window appear & click Start on it. Thanks to dbmember from ModDB for this fix. Anyway enough about that, time to actually talk about the game. The open Outcast team are creating a sequel for a 1999 game known as Outcast, the game was well-known for the engaging and realistic AI and for having an impressive environment for its time. The mod places its origins between 2002 and 2003 when it became apparent that there would be no sequel to the orignal Outcast, after several engine changes and plenty of hype about its progress we are finally beginning to see the orignal mod concept unfold beautifully. 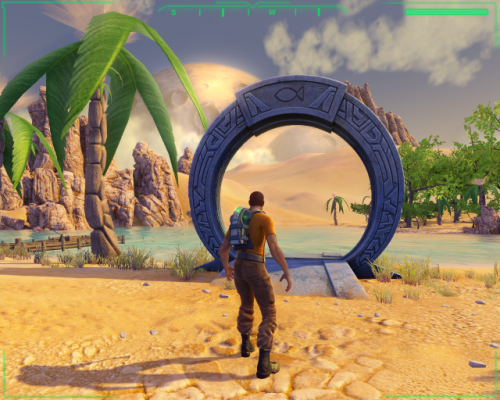 Having released another much smaller demo previously, the team seem to be keen to keep fans on their toes with tantalising details being released on the run up to the Oasis 1.1 release. The first thing I noticed when loading the game was the professional presentation of the mod. It was obvious that the team had put a lot of love and attention into the mod, there is a degree of polish on everything which is often unheard of with early releases of mods. There are elements of Crysis Wars remaining (especially evident within the menu) but outside of main menu it feels like a standalone commercial game. I’m not sure how many assets were used from Crysis Wars but I can honestly say that every asset I saw in the game looked incredible, the game world looked real, as I entered the different buildings I could belive that something could live there. The attention to detail in this mod is phenomenal! A usual problem for mods is voice acting, it’s not easy to acquire good quality voice actors to work on a free modification but somehow the open Outcast team were able to produce an impressive dialogue kept alive by convincing lines and voice actors. 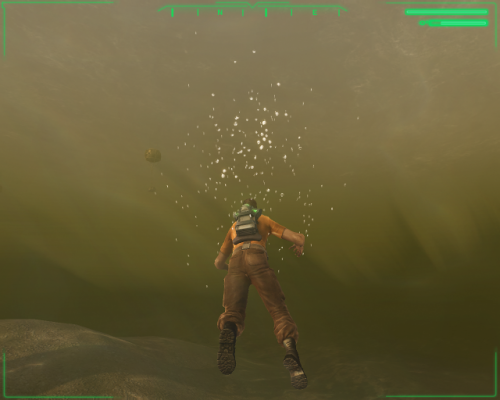 I’m usually a sucker for games with any sort of water content and this mod didn’t fail to deliver, the quest will have you diving into the Oasis in order to complete certain tasks, it’s an excellent time to enjoy the jaw-dropping water effects that the CryEngine2 offers, it’s easy to see why the team moved onto the CryEngine2. The story starts out relatively slow, having you doing tasks around the starting village but despite this it still remains enjoyable, it’s amusing to see the way your character communicates with the aliens and some of the tasks are so ridiculous that it’s funny. It’s the usual affair with the quests, you’ll find yourself running between NPCs in order to find items, complete jobs and the occasional bit of target practise. It’s simple yet fun, I didn’t feel bored during the quests, I was eager to delve more into the world, the most disappointing part was where it had to end. The looming city ahead beckoning my small boat towards it. Fortunately I found my own way to the city. As is to be expected with an early peek into a mod there were plenty of bugs, my favourite being the ability to gain access to the city, even if it meant a lot of swimming, the teams had smartly placed a Sanegta (a shark-like creature) in the water which would stalk you and then kill you in one seemingly unavoidable attack. Though I somehow managed to kill it and afterwards was able to swim as I pleased in the second area. Another bug was one of the Talon (the alien characters) would have an animation glitch where his legs would go above his head and he would float around. As the team have already stated, they are already aware of bugs present in the release and since this is only a tech demo it is to be expected. One of the final points I’ll make is the visual style, the initial area around the Oasis is full of very pastel calming colours, it’s pleasant on the eyes and gives a distinct beauty to the alien landscape, however when you finally step through the Daoka (teleportation gate) you will find yourself in a much darker environment, while retaining a deep sense of beauty, it produces a more intense environment, it’s foggy and in the distance you can see a looming town which beckons you in. I won’t be scoring this as it’s still early in development so I’ll wait for a more complete release before judging it, I would urge you to go try it out now.